The success of this recipe depends on the choice of cheeses. Ricotta replaces a white sauce, mature cheddar has flavour and bite, parmesan adds a salty punch and gruyere style (Australian is available) has delightful melting qualities and a rich, nutty flavour. Pre-heat oven to 180°C and grease a medium sized (2 litre) casserole or baking dish. Add macaroni to a large saucepan of salted boiling water, stir well and bring back to the boil according to directions or until al dente (approx 12 minutes). Drain well. Meanwhile, melt butter over medium heat in a medium saucepan, add leek and garlic and cook for 3 minutes or until soft. Add milk, cream, mustard and nutmeg, mix well and bring to the boil. Remove from heat and whisk in the egg, ricotta, ½ cup gruyere cheese (reserving ½ cup for topping), ¼ cup parmesan cheese (reserving ¼ cup for topping) and mature cheddar cheese. Stir until combined. Gently fold in reserved macaroni and chives. Season to taste with salt and pepper. Pour macaroni mixture into prepared dish. 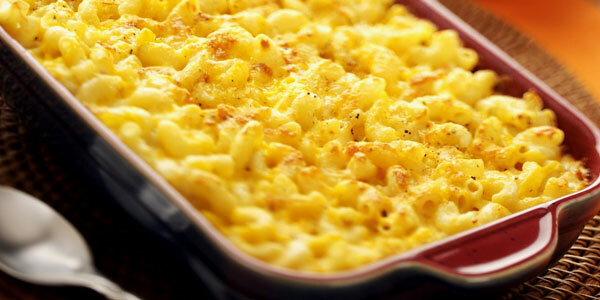 Combine prosciutto, breadcrumbs and remaining ½ cup gruyere cheese and ¼ cup parmesan cheese and sprinkle over macaroni. Bake for 20 minutes or until the sauce is bubbling and the top is golden. Remove and rest 5 minutes. Serve with green salad, if desired. Lyndey’s Note: I like a tube shape pasta for this style of recipe, so elbow macaroni or penne could be used. Mozzarella can be used in place of the gruyere and crumbled blue cheese can be added to the mixture.